India by Design: Colonial History and Cultural Display maps for the first time a series of historical events—from the Raj in the mid-nineteenth century up to the present day—through which India was made fashionable to Western audiences within the popular cultural arenas of the imperial metropole. 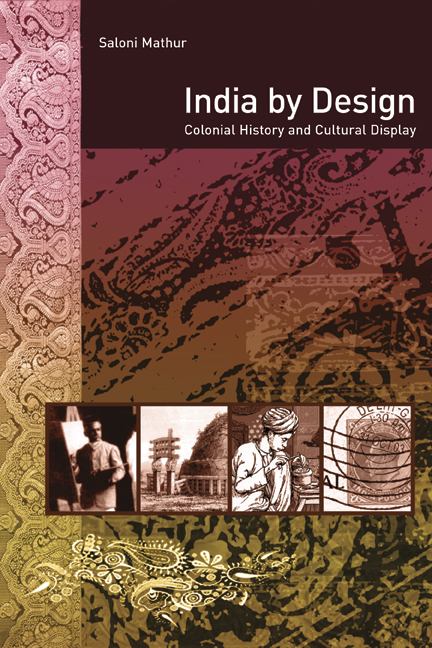 Situated at the convergence of discussions in anthropology, art history, museum studies, and postcolonial criticism, this dynamic study investigates with vivid historical detail how Indian objects, bodies, images, and narratives circulated through metropolitan space and acquired meaning in an emergent nineteenth-century consumer economy. Through an examination of India as represented in department stores, museums, exhibitions, painting, and picture postcards of the era, the book carefully confronts the problems and politics of postcolonial display and offers an original and provocative account of the implications of colonial practices for visual production in our contemporary world. Saloni Mathur is Assistant Professor of Art History at the University of California, Los Angeles.